WASHINGTON, DC -- U.S. defense and diplomatic officials said Thursday that Russia is firing artillery across its border at Ukrainian military positions, an assertion that Moscow now is directly engaging in hostilities against Ukrainian government forces. A pro-Russian fighter stands guard next to bodies near a destroyed Ukrainian tank in the northern outskirts of the city of Donetsk, eastern Ukraine Tuesday, July 22, 2014. The accusation represents a harsh new U.S. stance against the Kremlin in the aftermath of the crash of Malaysia Airlines Flight 17, downed last Thursday by an antiaircraft missile. The U.S. has been accusing Russian President Vladimir Putin of supporting armed pro-Russia separatists in eastern Ukraine, but the newest allegation suggests the conflict is coming to more closely resemble a war between the two countries. Also Thursday, the Organization for Security and Cooperation in Europe reported that "shrapnel-like, almost machine-gun-like holes" were found in two separate pieces of Flight 17's fuselage, evidence consistent with the use of a sophisticated antiaircraft missile. Reports of Russian artillery fire into Ukraine also were picked up by social media, said a U.S. official, but were confirmed with a "high level of confidence" by U.S. intelligence agencies. U.S. officials said the information on the Russian attacks was declassified Thursday. "If true, this represents a serious escalation on Putin's part," said Michael McFaul, the former U.S. ambassador to Russia and White House adviser. "Instead of using last week's tragedy as a pretext for ending this war, he seems to be doing the opposite, doubling down." A spokesman for the Russian embassy in Washington disputed the allegations. "Unfortunately, it is not for the first time that we hear unproven allegations," the spokesman said. "In fact, it is the Russian territory that is being shelled from the Ukraine." 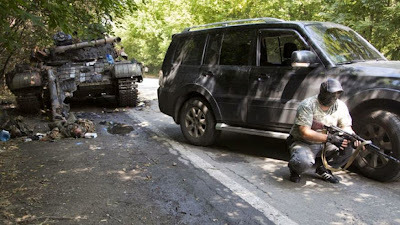 The spokesman said Russian territory came under fire from Ukraine nine times in June and July, killing one Russian citizen. State Department spokeswoman Marie Harf said the U.S. has evidence that Russia intends to deliver powerful rocket systems to pro-Russia rebels in Ukraine, but declined to provide details about the systems or about how that conclusion. was reached. "We have new evidence that the Russians intend to deliver heavier and more powerful multiple rocket launchers to the separatist forces in Ukraine and have evidence that Russia is firing artillery from within Russia to attack Ukrainian military positions," Ms. Harf told reporters at a news briefing. Moscow denounced as fantasy previous charges by Kiev that missiles fired from Russia brought down two Ukrainian military planes on Wednesday. Defense officials said the U.S. still hasn't determined what brought down the two Ukrainian fighter planes. Rebels have claimed to have downed the planes with portable, shoulder-fired missiles, known as Manpads, and U.S. officials have said that is possible. Russia has been firing across the border into Ukraine for "several days," according to a senior U.S. defense official. The U.S. has confirmed these strikes only within the last two days. "This is clearly a military escalation," said Col. Steve Warren, a Pentagon spokesman. The senior defense official said the U.S. doesn't have complete battle damage assessments, but said the strikes for the most part appear intended to disrupt Ukrainian operations. The official said the attacks show Russia's intent to provide broader support to the separatists. "It demonstrates direct Russian involvement in Ukraine," said the official. "It does up the ante." Another defense official said the artillery fire began "about the same time" the Malaysian airliner was shot down. So far, the fire has all come from tube artillery. The U.S. doesn't have conclusive intelligence that Russia has fired antiaircraft rockets into Ukraine, although officials earlier this week said there was evidence a Ukrainian cargo plane was downed July 14 by a missile fired from Russia. Even if used mainly to stymie Ukrainian forces, U.S. officials remain worried that a sustained artillery barrage by Russian forces eventually could counter recent Ukrainian advances. "Historically, artillery has been the biggest killer on the battlefield," said the second defense official. "If used effectively, artillery can have a noticeable impact." U.S. officials say the escalation by Russia is a risk and represents a sign that Moscow is worried about the Ukrainian government's counteroffensive against the separatists. Moscow, U.S. officials say, is worried that if the separatists don't turn back the Ukrainian government's advances, the separatist cause could be severely damaged or even lost. The strikes, officials said, also are a sign that Putin isn't going to back down in his support for the separatists, even in the wake of the shootdown of the Malaysian airliner. Russia has between 15,000 and 18,000 troops on the Ukrainian border, but officials said there hasn't been a significant buildup of firepower since the downing of Flight 17. Russian motorized infantry units all have artillery and rocket launchers assigned to them. Last week, the U.S. imposed a new type of sanctions targeting the financing activities of some of Russia's biggest companies, including Kremlin-controlled oil giant OAO Rosneft. Canada also boosted its sanctions against Moscow, acting Thursday to target several of the same Russian companies named by the U.S. a week ago, including the country's second-biggest natural-gas producer and Kalashnikov, the iconic maker of automatic weapons.